“Makani luna ke lele `ino mai la ke ao.” There is a wind from the upland for the clouds are set a flying. Chief Keoua kua-hu`ula’s priest’s observation of the clouds and wind, just before landing their canoes at Ka-waihae for a meeting with Kamehameha, proved ominous as Keoua kua-hu`ula was bludgeoned to death soon after stepping ashore. This event marked the beginning of Kamehameha’s quest to conquer and unify the Hawaiian Islands. Today, Pu`ukohola Heiau continues to overlook Kawaihae and remains as a poignant reminder of its importance in Hawaiian history. Kawaihae remained virtually unchanged for almost two hundred years. An aerial photograph taken in 1949 shows a meandering coastline with beaches and small fishing boats anchored near shore, protected by the large, fringing reef half a mile or more off shore. In the mid 1950’s, construction was started on Kawaihae deep draft harbor by the U.S. Army Corps of Engineers and was completed in 1959. The construction of the harbor forever changed the face of Kawaihae. In 1969, Operation Tugboat, conducted by the U.S. Army Engineer Nuclear Cratering Group, using conventional explosives, blasted out the existing basin located at the southern end of the harbor for light draft vessels. Today, breakwater construction is underway to finish the much needed small boat harbor. Surfing has always been a part of Kawaihae’s history with its ideal formation. The large expanse of edging reef which fronts the breakwater _ including the Spencer Park area _ contains a number of surf spots. These breaks are located over a well-developed bench reef which extends several hundred yards out to sea from the edge of the breakwater. This configuration creates a long, slower-peeling type of wave ideal for longboards. Waves surfed at Kawaihae are generated from immense, low-pressure systems in the northwest Pacific, usually during the winter and early spring months. Kawaihae was a royal center where Ka’ahumanu, Kamehameha’s favorite wife — and an accomplished surfer — was known to have ridden the waves while in residence there with the king. Since those days, little or no surfing took place at Kawaihae until the early 1970’s. A few local surfers and part-time Big Island surfers, such as Whitey Harrison, rode the breakwater, but it was not until the early 1980’s, with the rebirth of longboards, that Kawaihae became the popular surfing mecca that it is today. structed, a significant area was filled with coral dredged from the deep draft harbor basin. This section, for the most part, remains undeveloped, with the exception of the Army LST Ramp and staging compound. Just makai of that is a flat, coral-filled area which borders on the ocean. This zone, in recent times, has been the gathering place for surfers riding the Kawaihae breakwater. 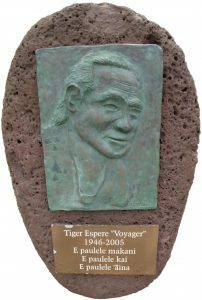 In 1992, Tiger Espere, a well-known surfer and water man created the “Tiger Espere Longboard Classic” surfing contest. For the last five years, it has brought together surfers from this island and other areas in the state to compete in an atmosphere of friendship and fun. Additionally, it has given many of us the awareness of the importance of this area, both as a recreational reserve and an historical/cultural resource. Through Tiger Espere’s efforts and leadership, the dream to create a cultural surf park at the breakwater site has become a reality. Senate Resolution No. 10, a “Senate Concurrent Resolution Urging That The Pua Ka`ilima O Kawaihae Be Designated A Site For Recreational, Educational And Cultural Activities” was passed in this year’s legislative session. “Pua Ka ilima” is the name of a small island which was once located at Kawaihae. The island was named for the ilima flower which flourished upon it. Thus, the non-profit corporation known as the Pua Ka`ilima Cultural Surf Park Inc. has been formed to develop and protect the area. Funded, not by taxpayers’ money, but rather with community and foundation support, the park will be developed in phases over the next several years. The first stage will concentrate on landscaping, including wind breaks and grassed areas, restrooms and showers. Additional phases will include Hawaiian cultural event facilities and a surf life-saving clubhouse. Pua Ka’ilima needs the support of the community to succeed. If you would like more information on the surf park, or to make a contribution towards its development, please contact Dave Barclay at 889-5225 or Bob Simms at 885-3534. Donations are tax-deductible.